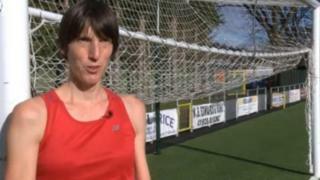 An ex-running champion has appeared in court accused of stabbing three men at a major UK athletics stadium. Lauren Jeska, 41, is charged with attempted murder and wounding two others with intent, at the Alexander Stadium in Birmingham on Tuesday. The men are reportedly officials from UK Athletics. One, 51, is in a stable condition in hospital, police said. Ms Jeska, from Powys, was remanded in custody to appear at Birmingham Crown Court on 25 April. The three victims, former Bristol rugby player Ralph Knibbs, Tim Begley and Kevan Taylor are from UK Athletics, according to the Birmingham Mail. A former English fell running champion Ms Jeska, from Wesley Terrace in Machynlleth, also faces a charge of possessing three bladed weapons: 12cm and 13cm kitchen knives, and a 30cm bread knife. UK Athletics has declined to comment on the case.